My name is Suzanne Sanger, and I live in the USA. I am an artist, working primarily in fiber. 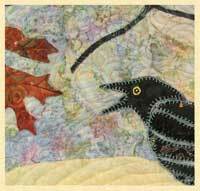 I have spent a lifetime exploring art, cloth, and needlework. Fabric and thread meet all my criteria for self-expression. Texture, drama, and subtlety all spring from their use. I enjoy finding or creating just the right fabric for a particular purpose, the textural play of light and shadow across a quilted piece, the bright contrast or subtle lure of color and texture that thread brings to the work. Fiber art is visual and tactile. It is multi-layered with virtually no limitations to one’s vision. It can be filled with color or depend on texture alone. Other media can be introduced to enhance fabric and thread. Endless variety is possible. Boredom is out of the question. My work continues to evolve in both subject and technique. Recurring throughout is a full range of color possibilities, texture, visual impact, and meticulous detail. I love the colors of the world as it is. I love the colors that can be imposed on the real world to see it in a new way. The world is enlivened not only by color but also by its textures. I want to get in close and observe the nearly hidden textures of all of the creations of nature. I want to climb up high and see the equally hidden textures of the world as a bird might see it. I want to examine the faces and postures of the people who share the world with me. My technical arsenal includes but is not limited to hand and machine piecing, appliqué and quilting; hand dyed, hand painted, hand printed, computer printed and commercial fabrics; hand embellishment including embroidery, thread-painting, beads, and found objects.